Colour: Green with creamy helix. 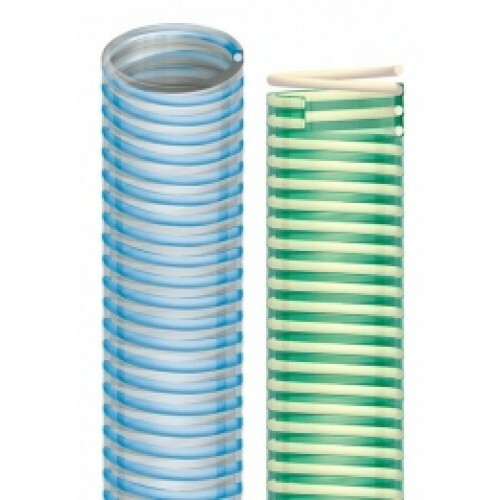 Technical Features: PVC hose reinforced with an anti-shock rigid PVC spiral. Completely smooth bore, slightly corrugated outside. Properties: Very good mechanical characteristics, strong and flexible, resistant to crushing, abrasion, ageing, UV rays, hydrolysis, atmospherical agents and most chemicals. Halogens free conform to RoHS. Upon request it can be manufactured in antistatic version adding a copper wire. Excellent for suction in general, particularly suitable to be used on slurry machines.